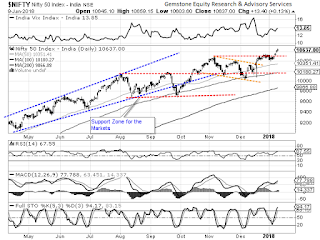 After two days of breaking out above 10490-mark, the Indian Equity Markets took a breather and consolidated on Tuesday. The benchmark NIFTY50 ended with a negligible gains of 13.40 points or 0.13%. However, it continued to pile up Open Interest. Though we expect a quiet opening on Wednesday, we expect that despite some consolidation, we will ultimately see the Index inching higher after some range bound movement, if any. The buoyant intent is further support by Inter-market analysis of the Hong Kong markets with which our Markets remain very strongly co-related. Hang Seng Index has went on scale further lifetime highs. Wednesday will see the levels of 10655 and 10710 working out as resistance area for the Markets. Supports come in at 10590 and 10545 levels. 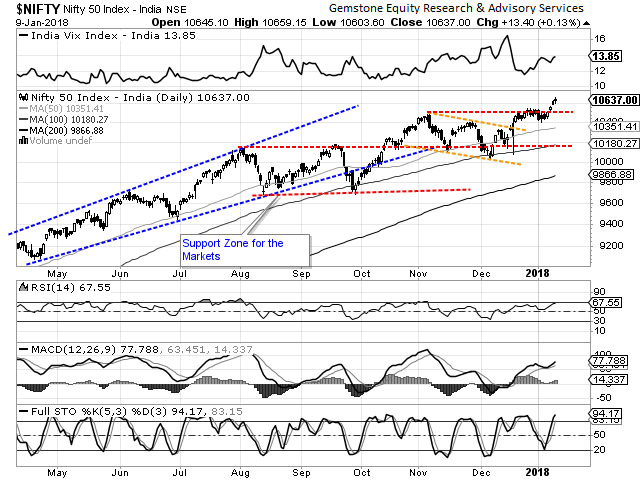 The Relative Strength Index – RSI on the Daily Charts 67.5491 and it has marked its fresh 14-period high which is bullish. The Daily MACD stays bullish while trading above its signal line. No major formations were observed on Candles. The pattern analysis reveals the NIFTY taking some breather after two days of breaking out. This consolidation may last but overall under current continue to remain buoyant. After two days of up move, it will be no surprise if the Markets see a range bound consolidation or movements in a defined range. However, at no point, it shows any sign of a major corrective move. In most likelihood, we may see the Markets consolidating for a while and then resuming its up move. We continue to recommend making selective profits with each consolidation that occurs. Overall, continuation of positive outlook is advised for the day.